It’s a subtle way to say thank you to an individual who’s gone above and beyond. Have you got a star player on your team? Does that sound like you? 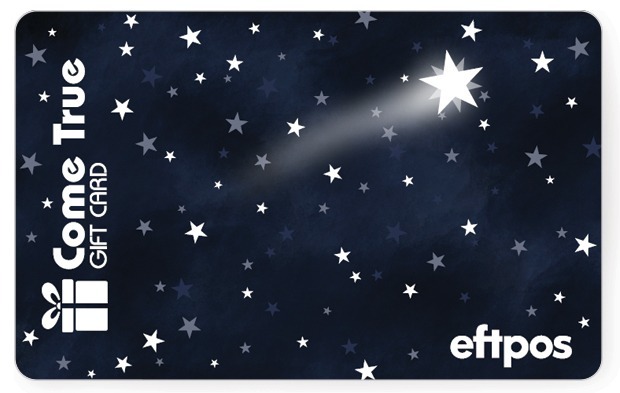 Well, our shooting star eftpos gift card is an easy choice for you. But it’s more versatile than just that: you could thank a star employee, but you could also use this card at Christmas time — you can’t deny it’s a bit festive. It’s also the perfect gift for awards night. Another factor to consider here: this is one of our ‘generic’ cards. Now, we know that using the word ‘generic’ doesn’t sound very exciting, but it does explain one of the key benefits of this card — it’s quick, easy, and ready to roll. This means you can get your cards into production faster: there’s no waiting around for design approval. It’s great for when you just can’t wait.